Delilah King, age 95 years, of Archbold, passed away Friday afternoon, April 5, 2019, at Fairlawn Haven in Archbold. She was born October 29, 1923, on the farm where she lived her entire lifetime, a daughter of Henry and Ida (Weber) King. She retired from the former Lauber Manufacturing Company in Archbold. She enjoyed gardening, woodworking, crocheting, and canning fruits and vegetables from her garden. She thrilled in giving gator rides on the trails in the woods. She was a member of the Central Mennonite Church near Archbold. 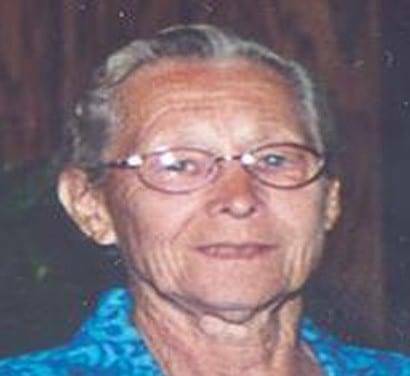 She is survived by one brother, Andrew (Doris) King of Archbold; one sister, Florence Nofziger of Pettisville; many nieces, nephews, and great-nieces and nephews. She was preceded in death by her parents; four brothers, Freeman King, Dale King, Olen King, and Orville King; three sisters, Dorothy Lantz, Inez King, and Martha King. Memorial services will be held on Wednesday at 11am at the Central Mennonite Church with Pastor David Elkins officiating. Interment will precede in the Pettisville Cemetery. Friends may call at the Fairlawn Chapel from 2-7pm on Tuesday. The family suggests memorials be given to Adriel School, Mennonite Central Committee, or Gideons International. Be the first to comment on "Delilah King (1923-2019)"